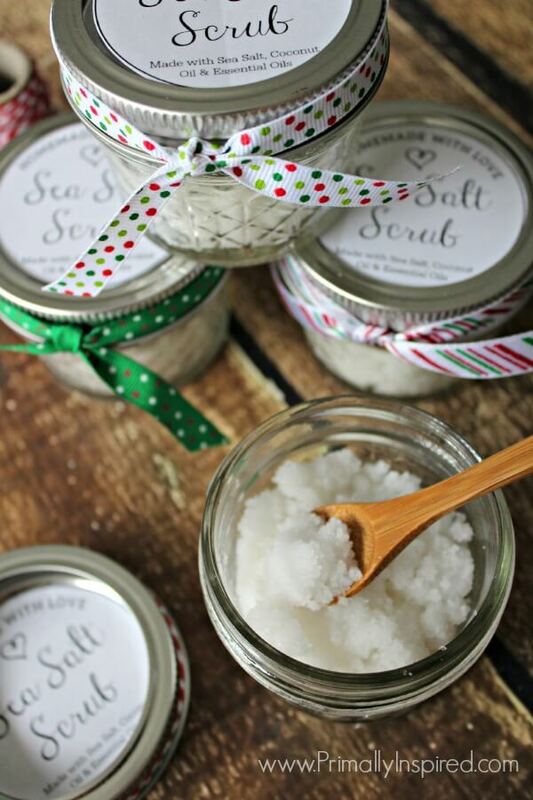 This easy and nourishing recipe contains sea salt, coconut oil and essential oil. That’s it! And your skin will love it. I know mine does. In fact, if I know I’m going somewhere special, I make it a point to use this sea salt scrub on my face and body the night before so my skin is super smooth and glowing. Sea Salt is filled with important minerals and contains many healing properties for skin health. 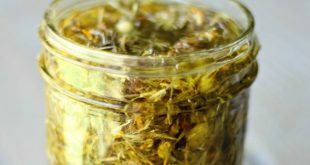 It has the unique ability to pull toxins from beneath the skin. It’s an amazing exfoliator to remove dead skin cells, leaving your skin soft, smooth and glowing. 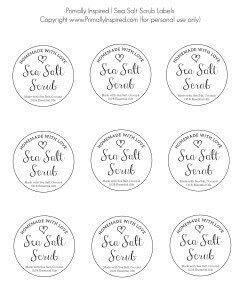 Sea salt also stimulates cell growth, improves circulation and helps the skin absorb and retain moisture. You can find sea salt almost anywhere. Just make sure it’s natural sea salt with no additional additives. Fine or extra fine sea salt works best for this recipe, especially if you are using it on the face. Coconut Oil has the unique combination of anti-aging, anti-inflammatory, antioxidant, anti-bacterial and hydrating properties, making it an excellent choice for a nourishing and healing anti-aging scrub. It not only repairs skin, but it hydrates, smoothes, reduces inflammation and quenches free radicals. 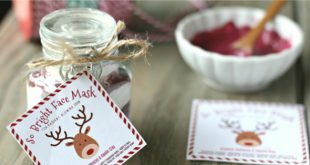 I also wanted to include some cute printable labels (download HERE) for you so you’ll have a super easy, super adorable gift all ready to give – just print and cut out the labels, tie a bow on the jar (I use THESE jars) and you’re set! 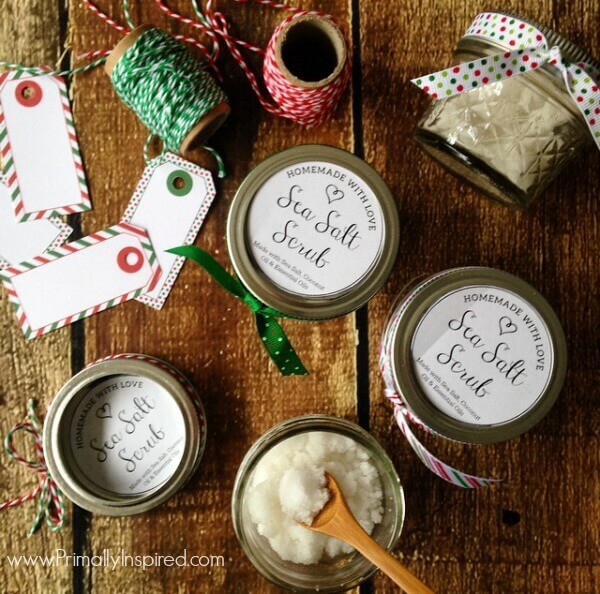 Enjoy and happy sea salt scrub making! Spoon into individual jars - I use THESE jars - this recipe makes enough to fill 4 of this size jar. Wish I was there with you guys! 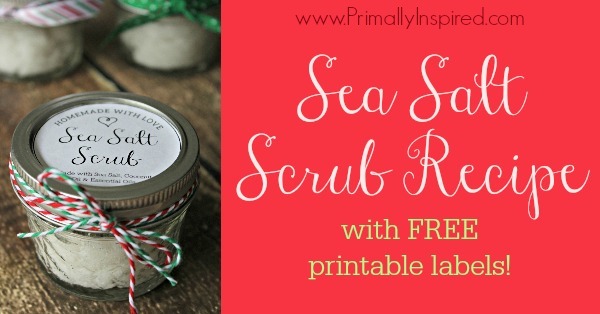 That sugar cookie scrub sounds so yummy!! love this easy gift idea! Do you melt or soften the coconut oil first? Can’t wait to try this! Love that I have all of the ingredients on hand. My coconut oil is rock hard too…think I will melt it first. Do you find that it leaves your shower slippery when you rinse it off? Hey Elizabeth! It does leave my shower slippery. When I use it, I make sure to spray down my shower as soon as I get out. It helps cut the oil right away (I use Branch Basics cleaner, but any cleaner should help). Hello! I just made these and they are adorable! I have a question to ask that may be a little silly but here goes… I wasn’t smelling much of the oil in my batch so I ended up doubling the drops. Now Im a little concerned that it could be too much and become toxic. Do you think this could be a problem? Im not an EO expert at all. If its too much then ill just add more salt and coconut oil to balance it out. Hey Liz! What essential oil did you use? I am not an essential oil expert, but if the same thing happened to me, I personally wouldn’t even worry about it, especially if I used lavender. 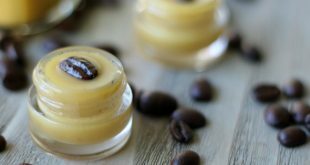 I’ve also seen similar sea salt recipes using more essential oil than I have listed. That’s perfect, Joyce! I love Redmond Salts! Is it possible to use coarse sea salt if it’s all that one has? Yes for sure! Coarse is a little rough for the face, but it’s great for the body. You can still use it on your face, just be extra gentle when scrubbing. Also, you can pulse the coarse salt in the blender or food processor (or coffee grinder) to get it finer if you wanted, too! How long does this last? I am planning to make these for gifts for my bridesmaids and I would love to get them made as far in advance as possible..but I didn’t know if it would go bad after a certain number of months. Thanks! Hi There! I am LOVING your whole website, have been reading all bits and pieces of it all morning! So informative, thanks for that. Can I use Epsom salt in this “recipe”? and mouth feel afterwards. I hadn’t read about scrapping your tongue afterwards (like the spoon idea), but usually brush my tongue and roof of my mouth when I brush my teeth anyway, so maybe that is working for the scrapping. 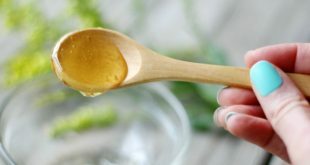 Are there any detrimental problems if I want to oil pull both morning and night and is it fine to do either or both on a daily basis? I don’t have any problem with not swallowing it and I spit it out when done into a paper towel and throw in the burnable trash (we live out in the country, okay to have a burn pile). Thanks for all the info’ and any reply to this email. 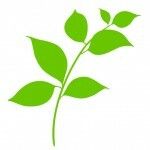 I’m looking forward to becoming a regular reader of your site/blog. Yes, Epsom salt would be fabulous in this recipe! I love that idea!! I’m going to do a 50/50 mix of Epsom and sea salt the next time I make it! We live in the country, too and often have a burn pile – love living in the country!! 7652716276 Thanks so much for this!!! You are a blessing!!! Hi Kelly!! I came across you on Pinterest and I am going to do this for my daughter-in-law’s bridal shower thinking of using the Lavender!! Thanks for the Labels was also going to use the tags so I can add her name on it!! So happy I can make it so it is done with Love!! Hi Kelly! I love your recipe & so excited to make it with my doTERRA essential oils to give as gifts!! It seems like I am having trouble downloading the labels. When I click on all the great links you have posted to download them it says “not found”. I love this recipe so thank you. I used Dead Sea Salt- fine but I found my salt wasn’t fine enough for my taste…urgh it felt rough on my skin, so I think I’ll recycle this batch in some baked bath salts. Have you tried it with a different oil? I find the feel of coconut oil bit greasy, maybe i’ll use less next time or I’ll try Avocado oil for me next. Hi Audrey! Yes, I’ve used a number of oils for this. I think my favorite is Rosehip. It’s so lightweight, absorbs easily and isn’t as greasy. 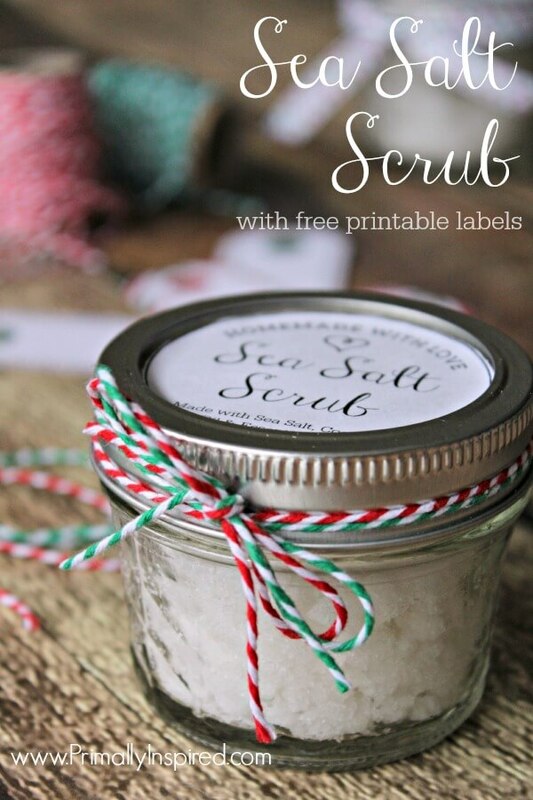 I have been using your salt scrub recipe for over a month now and I love it. I use Himalayan sea salt that I get at Sprouts for $2.99 a pound. I did add about 1-1/2 tsp Argan oil to your recipe just because I have it but otherwise it is your recipe all the way! It is so generous of you to provide labels for people like myself who haven’t a clue how to go about creating something so clever! Thank you for a terrific recipe and a very informative web site. Hi Denise! Thank you for your comment! 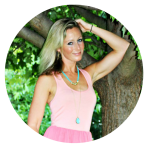 I love that you added Argan oil – I love argan oil and think it’s a wonderful addition and idea! Printable labels dont work because the 2 lines of copy at the top make the whole thing off. Anyone know how to fix this.?? Yes, that would be perfect, LoraJane! tried to use your printable labels but they failed to load on my computer. Any suggestions. But if you aren’t an Amazon shopper, you may be able to find them in craft stores, too! I tried your recipe tonight to make some Christmas presents. Easy to follow, smells lovely, hopefully the recipients will like them!